Those first three months have flown by and from my original list of 21 outstanding projects I have completed seven…and added three (edit) five new ones. It could be worse, at least my overall numbers are heading in the right direction! 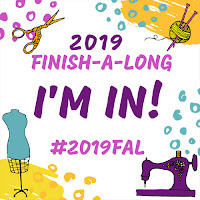 I’ll be using the hashtag #2019FALQ2afoxmadethis on Instagram to link all my finishes from this post together. These two versions of the Summer Sampler quilt-along are both missing the last 5 blocks. I’d like to finish the Amy Butler one in particular, hopefully both. I still have all the fabric set aside and the block patterns are to hand, so really there’s no excuse. I’m dying to see this quilt finished, even though its massive size means it dwarfs all the beds in my house and it doesn’t go with any of the decor. For it to progress I need to pull my finger out and get it to a long-armer. I’m torn between a couple of quilting ideas though… time to decide. I also need to piece the back together and make some binding. Of all my quilt UFOs this is probably the furthest from being finished. Started at a Sarah Fielke workshop in Huddersfield, on one of the hottest days of 2016, I still love the idea of this quilt and would like to pick it up again. Maybe it will become a wall-hanging rather than a full quilt? My current evening EPP project, but like most hand sewing, it’s slow sewing. I’m confident this will be a finish in the first half of the year though as most of the pieces are already cut, basted and bagged so it really is just a case of finding the stitching time. Ah, old friend. My first foray into both EPP and fussy cutting, the catalyst for my love of Tula Pink fabric. This project means a lot to me but it has been relegated in favour of Pollinate and other projects. I probably won’t return to it in Q1 if I’m honest with myself, but it deserves to get some love later this year. Trying to have three large EPP projects on the go, two of which require extensive fussy cutting was a bit of a poor decision on my part. This one may well rollover to FAL 2020 but never say never, right? Jenny Haynes, perhaps better known as Pappersaxsten, came to our Leeds Modern Quilt Guild to run a curves workshop. I started making her new Footloose pattern but have only completed 2/4 blocks. The picture below on the right is a mock-up of what it should look like when finished. This was a pattern test that I did for Sheri at Whole Circle Studio. It just needs basting, quilting and binding to finish it off. This was the product of another Sarah Fielke workshop (on another very hot day in Huddersfield). Originally I intended to make a set of four into a mini, but I think I’ve used the set aside fabrics in another project. I might border it and make a cushion or use it as a pouch front. It doesn’t look all that much in this picture but I’ve high hopes for this cabbage! Started at a workshop with Nick Ball a.k.a Quilts from the Attic, the king of improv veg quilting, this needs finishing off with a background and then it can be basted, quilted and bound. Another workshop product from last years Simply Solids Retreat. This EPP Kalidescope pattern match was made using the pattern and instructions by Amy at Coffee Rings Studio. I want to make two more from other Tula prints and frame them as a triptych for my sewing room wall. I drafted this design for three panels made up of HSTs to hang in my newly decorated bedroom. Two years on and the wall is still blank, I do have a small pile of HSTs though and fabric set aside to make more. Last, but not least, my final UFO from the Simply Solids Retreat. The start of an EPP block designed by Jenny Jackson of Hashtagsew. The fabric is all still set aside for this and I plan to make up a four or six block mini. I’m making the 52″ x 60″ sized version of this quilt, which require ~100 foundation paper pieced blocks and about the same number of plain blocks. The sew-a-long requires that I make at least one of each of the 40 unique blocks, posting five a week for eight weeks. I should have the top finished by the end of May, hopefully maybe even a finished quilt. This large 24″ block was completed in a workshop. I plan to quilt it and turn it into a big cushion. Last Christmas I made these simple little gift bags and used them in place of crackers at the dinner table (lotto scratchy and a mini bottle of tipple inside each). We’re having a belated Boxing Day celebration with family at the end of April and so I need to make a few more so everyone can have one. EDITED – 16 April 2019 – just adding a couple of extras before the link closes! Sneaking this one in before the link closes for Q2. I’ve just received the email detailing swaps for the Modern Quilt Club Retreat I’m going to at the start of June. Options are pin cushion and/or pouch and I’ve signed up to do both, so they’d better go on the FAL list. I want to make a pouchy gift for a friend who is bringing over some fabric for me when she comes here on holiday in May. I think I might try out the Devon Pouch pattern by @sotakhandmade. So there it is, my list of proposed finishes all ready to go when the link opens up on January 10th. I’m feeling really positive, having laid everything out like this makes me see that there are quite a few ‘easy’ finishes and its also helped me prioritise amongst my larger projects. Let me know if you’re participating too, good luck with all your FAL plans! What a fab list of projects you have on the go! I particularly love your EPP projects! So stunning! Thanks! i’m looking forward to cracking on with at least one of my EPP projects when I have some holiday later this month. Some lovely things there to finish! I’m looking forward to seeing your progress! Thanks, Looking forward to seeing what projects you tackle this quarter too. Great list! Congrats on your list getting smaller from Q1 to Q2. Well done! Looking forward to watching for your finishes and updates. You have some really beautiful quilts in the making. I would love to see Hot Mess finished too. I wonder how it will be quilted. Thank you, that is the million dollar question! What’s first up for finishing? The gift bags? (Great idea, by the way!) I’m going to enjoy guessing which projects you’ll work on/finish this quarter – good luck!! Gift bags and the big cushion I think.